Hundreds of thousands of people flooded into Shanghai's World Expo Saturday at the start of a six-month showcase of culture and technology seen as the latest sign of China's growing economic might. 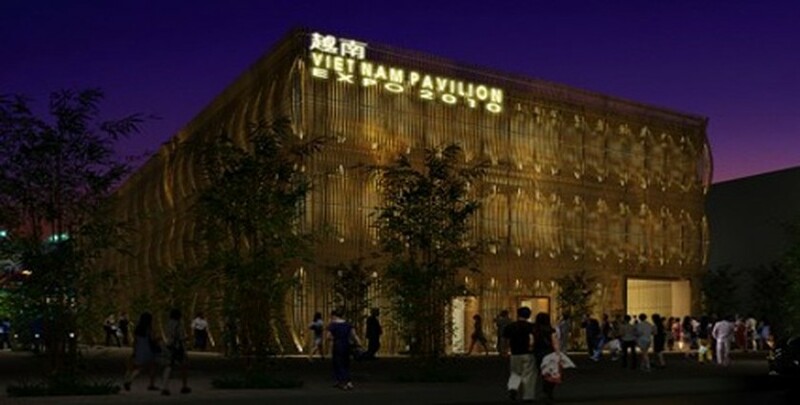 Vietnam Pavillion at the Zone A of the World Expo 2010 in Shanghai, China. Organisers have said all 500,000 tickets are sold out for opening day at the massive Expo park along the Huangpu river, where visitors will wander through the exhibits of 189 nations, as well as dozens of companies and organisations. "Everything is very colourful," Cui Yan, a 23-year-old Chinese university student, said outside the Mexican pavilion. "The architecture is amazing." "There are so many highlights -- I'm worried I can't see all of them on this trip," said Cui, who travelled from Ningbo, in neighbouring Zhejiang province, to be one of the first to catch a glimpse of the eye-catching Expo pavilions. A sea of people waited to visit China's red inverted pyramid -- the centrepiece of Expo park -- but queues were long at all pavilions. Signs outside the US and French venues said people faced a wait of four hours. Eager visitors used umbrellas to shield themselves from the blistering Shanghai sun as they waited patiently, the long queues doing nothing to dampen their enthusiasm. "I want to see the Canada pavilion first. So many of my relatives have emigrated to Canada and I want to get an idea of what kind of life they're living," retiree Huang Huifang, 58, said as she ran towards the building. Shanghai kicked off the Expo on Friday night with a star-studded music and fireworks extravaganza, signalling it would be bigger and brighter than the more low-key World's Fairs in recent years. Italian tenor Andrea Bocelli, Hong Kong action film star Jackie Chan and Chinese pianist Lang Lang performed for thousands of guests including Chinese President Hu Jintao and about 20 other world leaders. A record number of countries are participating in the event, which is expected to attract at least 70 million visitors -- the vast majority of them Chinese, many of whom have never travelled outside the country. Li Huahe, a 47-year-old telecoms company employee from Urumqi in far-western Xinjiang -- at the opposite end of the country from Shanghai -- said he bought his ticket months ago but could only stay a few hours before heading home. "I woke up at 5 am and I have a 2 pm flight. I'm worried about the crowds. I want to see at least one pavilion today," Li said outside the Swiss pavilion, which boasts a chairlift that soars over a three-storey-high meadow. Nations with an eye on China's consumer market of 1.3 billion people are pulling out all the stops to attract the attention of Expo visitors. "I really hope people will discover the attitude of the Netherlands. We want to have friendly relations with China," Dutch Prime Minister Jan Peter Balkenende told AFP as he surveyed the grounds from the top of the "Happy Street" pavilion, which aims to capture the feel and creativity of Amsterdam. Denmark has made a splash by bringing its "Little Mermaid" statue out of Copenhagen for the first time, France has Impressionist paintings and India is bringing in a cast of Bollywood stars. The hamburger and ice cream cone debuted at past Expos and food is once again playing a major role in attracting Chinese visitors to pavilions. Belgium was promoting fries with mayonnaise, Australia was serving meat pies and France featured champagne tasting. "This is the first time I've eaten foreign specialty food, I will try more," visitor Yang Wei said, sampling Uruguayan barbecued beef. In Shanghai, the spotlight will be on the cutting-edge design of the national pavilions, all embracing the theme of "Better City, Better Life". Highlights include Britain's stunning dandelion-like "Seed Cathedral", Spain's "Big Basket" made of 8,500 wicker panels, and Switzerland's pastoral pavilion. Du Yuping, a 52-year-old steel company employee from Shanghai, came prepared for the long queues -- with a blue folding stool. He said he came to Expo park last week on a trial opening day and ended up waiting up to three hours to see one pavilion, but was pleased to see that operations were running more smoothly on Saturday. "I want to visit Expo at least six times," Du said, sitting on his chair in the queue outside the Norwegian pavilion. "I'm focusing on European pavilions today."